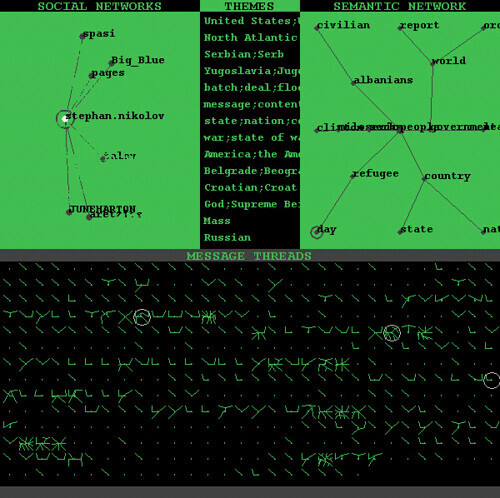 The Conversation Map system is a Usenet newsgroup browser that analyzes the text of an archive of newsgroup messages and outputs a graphical interface that can be used to search and read the messages of the archive. The system incorporates a series of novel text analysis procedures that automatically computes (1) a set of social networks detailing who is responding to and/or citing whom in the newsgroup; (2) a set of “discussion themes” that are frequently used in the newsgroup archive; and, (3) a set of semantic networks that represent the main terms under discussion and some of their relationships to one another. The text analysis procedures are written in the Perl programming language. Their results are recorded as HTML, and the HTML is displayed with a Java applet. With the Java-based graphical interface one can browse a set of Usenet newsgroup articles according to who is “talking” to whom, what they are “talking” about, and the central terms and possible emergent metaphors of the conversation. In this paper it is argued that the Conversation Map system is just one example of a new kind of content-based browser that will combine the analysis powers of computational linguistics with a graphical interface to allow network documents and messages to be viewed in ways not possible with today’s, existing, format-based browsers which do not analyze the contents of the documents or messages. Does Anyone Know Where To Find Free Usenet Access.. Any Good Free Usenet Websites etc?